I am at home. I am at home and home seems to have been waiting for me just as it was. From the first supper I had with my family, I felt like I fit right in again. Nothing seemed strange; it’s almost like an alternate life I easily slip back into. There’s a familiarity to it that bothers me. It’s the same thing that happened at Christmas. Things that I missed so much are immediately normal and everyday, and I feel like I don’t savor them and appreciate them properly. It takes focus to remember how much I miss this when I don’t have it, this carefree hanging out with family and friends. Who, by the way, are wonderful. Rachel’s singing never ceases to amaze me – she got second in her class of 18 in musical theatre at the Music Festival, without a teacher, and with only a few days preparation. I accompanied her on the piano, and my mom said she didn’t notice me at all, which is the best compliment an accompanist can receive. I play for Daniel’s saxophone class next week. The song is so beautiful that it makes me want to cry. I also love talking to mom and dad. I love the dishwasher and the abundance of spoons in the house. I love my best friend, I had no idea how much I missed her. She is patient with me. She’s sleeping beside me on the couch at the moment. I wish I could get back at her and tell you she’s snoring, but she actually sleeps quite quietly. I am glad she never tires of spending time with me. 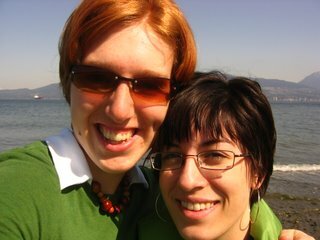 Speaking of Chris, we had an excellent time together in Vancouver before I returned home. 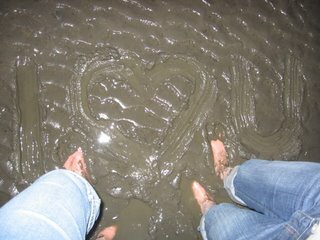 After she wrote the last blog entry, she graciously came walking through the mud with me, even though it was “the coldest one of her extremities have ever been”. 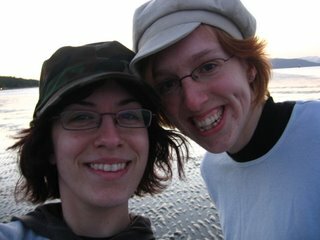 We also ran along the waves for a while, humming the “Chariots of Fire” theme, in honor of my father’s favorite movie. Christine has Harry Potter hair. After that, she helped me pack and clean, and even vacuumed. I could not have done it without her. She's a packing whiz. And I needed her baggage space. 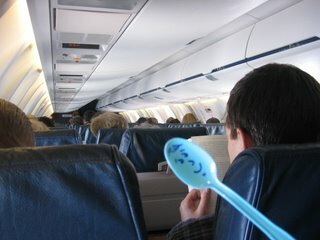 Then we flew together, and Blue Spoon flew too. We did ok, although we had a few close calls - I forgot the tickets at the baggage claim, and Christine forgot my camera on the plane. But we made it. With a little help from our friendly stewardess. One exciting thing that happened is that one of the eaglets was born on Hornby Island! Unfortunately I haven’t been able to see the little guy yet, because the website was flooded with visitors, and it doesn’t work very well. You can give it a try though. My grandma thought it was cool. http://www.infotecbusinesssystems.com/wildlife/. It was great to hang out with my grandma, especially since she shares my love of birds. She also told me stories of her college hi-jinx. Hi-jinks? Highginks? She told me about using a rope to haul something fermented into her college dorm, through the window. Tomorrow I start my job. It sounds like Robin, my superior, is getting lonely and bogged down with work, so it should be fun to help her out. Our office is in the children’s craft supply room at the church, tucked away in a corner. I look forward to doing a job so different from school, writing things that won't get graded and reading things I don't have to write about. I’ve been thinking about blogs, and why I started writing one, and why I write now. Originally I wanted it to be a way to keep up with people at home without having to write too many personal e-mails. I still write for that reason, but I’ve also started to have fun with it. I’ve really enjoyed writing this way, just as a hobby, to relax. I like being creative with the way I tell stories. People have remarked that my blog is fun to read, but it doesn’t really sound like “me”. Perhaps I am guilty of making myself sound more exciting than I am, and writing what I think you might want to hear. I’m really not very funny or witty or dramatic in person. I can actually be quite boring and uninteresting, and I rarely think of entertaining things to say off the top of my head. Mostly it just comes when I write. Maybe I should put a disclaimer on my blog to warn people that this is only one side of who I am. It’s my most vicarious self. Do not be disappointed if you get to know me, and do not think that I’ve changed if you already knew me. I'm just Beth. This is blog Beth. Anyway, thanks for reading. I hope to continue to write this summer, if I don’t get too excited about being outside. 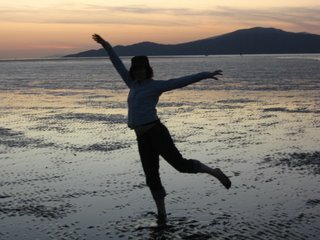 I miss you, beautiful mountainous oceanous Vancouver. I miss you, roommates (who must be moved out by now). I will miss singing in the Gospel Choir tomorrow. But I won’t lie… it’s good to be home.